Jordan Spieth announced himself to the rest of the 2018 Open Championship field on the first tee on Saturday. Sure, Spieth had completed an under-the-radar first two rounds after which he sat just a few strokes back of the lead, but the real warning siren came when he pulled driver at the first. Spieth, who said he kind of wanted to "send it" on No. 1 despite caddie Michael Greller saying he liked the lay up, drove the green at the par-4 first hole and sank the putt for eagle to get within one of the lead with several games still to go off behind him. Then he constructed one of the best rounds of the week as he made four more birdies and no bogeys en route to a 6-under 65 and the lead at 9 under at the time he finished. Spieth sits atop the leaderboard with Kevin Kisner and Xander Schauffele. It was vintage Spieth, or at least as vintage as a 24-year-old's rounds can be. Healthy par saves, tight irons, aggressive putts and a collection of his thoughts and his wayward shots in order that he might reorient them and this entire tournament to himself. This is what he does. "Today was a really, really solid day," Spieth told Golf Channel. "I felt like everything was moving in the right direction over the last few weeks, and certainly it came through." Spieth birdied No. 4, No. 11, the easy par-5 14th and then he exacted a little revenge on the par-3 16th, a hole he bogeyed each of the first two days. He said his goal was just to hit the green and make a par. He did one better. The long, brutish hole led to a pair of 4s coming home for Spieth in Round 1 and Round 2, but on Saturday it led to his closing act. The 2017 Open champ birdied the hole at 7:25 p.m. local time, and for the first time all day, he led the tournament alone with the rest of the field behind him. Chasing a leader at a major is one thing. Chasing a three-time major winner who could not be more built for links golf if he was the offspring of Young Tom Morris is quite another. "You just have to have great shot after great shot after great shot (over the final few holes)," Spieth told Golf Channel. "You just miss one of them and you never know what lie you're going to get." Spieth has had a weird year, especially for him. He hasn't won since Royal Birkdale one year ago, and he has just four top 10s on the PGA Tour. He's struggled with the putter, and he's missed the cut at a major. 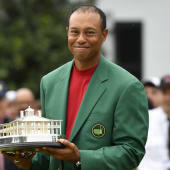 But it seems a return to the birthplace of golf and a relinquishing of the Claret Jug after a year of drinking from it have been good for his game. The stakes will be high for Spieth on Sunday; they always are when you have a late afternoon tee time at a major. He turns 25 before the month is over, and a victory at Carnoustie on Sunday would give him a collection of four majors at age 24. One golfer has ever accomplished that in the modern era, and he's currently four back of Spieth at this event. His name is Tiger Woods. "I feel like I've been improving each day," Spieth told Golf Channel. "I know as well as anybody that anything can happen in an Open Championship on a Sunday. I'll try and make the round as boring as possible tomorrow." There's still a ton of golf left to be played. You don't have to go back very far to remind Spieth of that. But all week his game has looked sharper than it has all season. There's an amalgamation of toughness and imagination you have to have to win an Open at a creative course like this one with this laughably-good field. Maybe nobody in the world coalesces those two traits -- tenacity and imagination -- into a more complete package than Spieth. It might not mean he gets to return home with the Jug he brought over. But then again, it might.